Might Threaded Conversations Be Coming To Twitter? There’s no question that Twitter’s web experience has been improving pretty rapidly over the past several months. However, one area that’s still lacking is a good way to view conversations. Clicking on the “in reply to” links is tedious for long conversations. Several third-party apps (including Twitter’s own native iPhone app — which they bought) are much better at doing this. One of those is an app called Twitoaster. And its creator just got hired by Twitter. 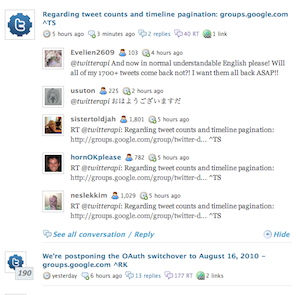 Twitoaster is the work of French developer Arnaud Meunier. As he tweeted and blogged today, he’s going to work for Twitter after getting to know some of the team following the Chirp conference in April. Of note, Twitoaster’s speciality was the threaded conversation view it gave to tweets. So does that mean this is coming to Twitter? Not necessarily — Twitoaster eventually added a number of other features — such as analytics — that could point to how Twitter could use Meunier’s skills as well. But given the direction Twitter has been going with its web product, I would be surprised if some sort of better conversation view wasn’t added to the site relatively soon. Another key focus of Twitoaster is tweet archiving. That’s another feature Twitter could definitely improve upon. Currently, thanks to Twitter’s search limitations, once a tweet is a couple of months old, it’s basically lost in the Twitter.com ether. If Twitter had a better archiving mechanism for old tweets, it could extend the life of them, and make them much more useful. All of this, of course, is some fun late Friday afternoon speculation. But Twitter was clearly impressed with what Meunier built, and I wouldn’t be surprised if they use his skills in a similar fashion on their core product. Meanwhile, Twitoaster will live on, but Meunier says not to expect any new features as he’ll be focused on his new job.